You may come across a situation, where there was a virus attack on you IT network. In another situation some of the corporate users may be accessing the streaming sites which drain the Internet bandwidth. First it should get notified instantly, Firewall Analyzer does this promptly. Will the alerts alone be sufficient to mitigate the effects of the attack or rectify the cause of the bandwidth drain? No. You need to take swift and automatic action to tackle the situation. If you depend on manual remediation measures, which are inherently slow, the virus will spread and will bring the whole network to a grinding halt or the business will get crippled as the bandwidth is not available for critical business activity. Also, the method of taking action should be flexible enough to address different security scenarios as given above. You may want to run a program or script to kill a process, block a port, user etc. Firewall Analyzer addresses this requirement using a feature called ‘Run Script’ (Program) which allows instant remediation to your network threats. How Firewall Alerts and Program Execution help to mitigate threat? Email & SMS notifications are self-explanatory. ‘Run Script’ (Program) is a powerful and flexible feature. It allows you to write custom program, which get automatically executed when an alert gets triggered. Ensure that the program you write carries out remedial action according to the alert conditions as discussed above. For the sake of demonstration, let us assume that you would like to be notified of any BitTorrent process in your organizations’ network and immediately kill that process. Omit Send the notifications once and do not send for ‘This day, This week, This month, Custom period’ selection. 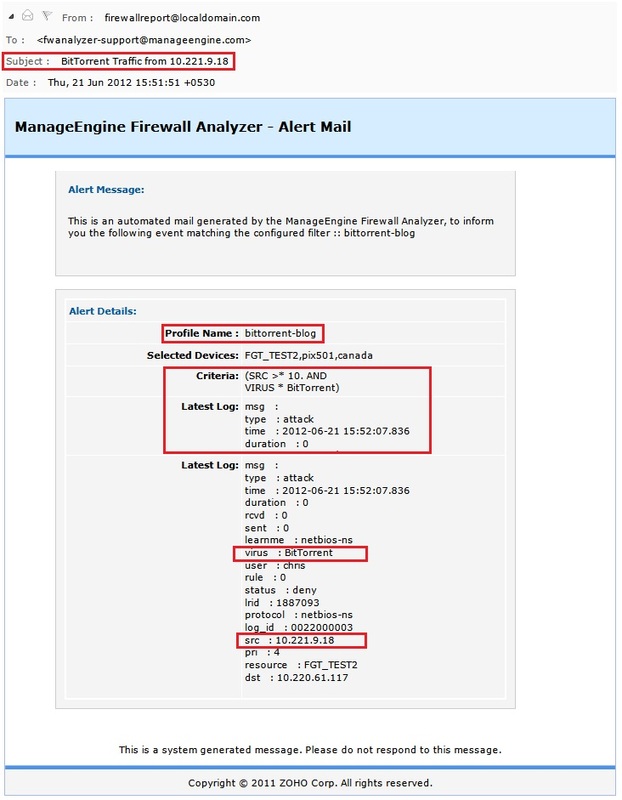 You may also be interested in some of the alert profiles discussed in the Firewall Analyzer forum post. The post also contains alert profile, which can be imported. With such a powerful feature that Firewall Analyzer provides, correlating events and taking immediate action becomes so easy for a network administrator. Explore the possibilities!